After our high altitude adventures on Sunday, we decided to stay on the city’s flat plain for a while. On Monday, we drove downtown to the Denver Botanic Gardens, where we spent most of the day. Our good fortune and good timing became apparent immediately when we saw how much of the garden was in bloom. The lilac garden offered up abundant color and fragrance, thanks to more than 80 varieties at the height of their blooming. More than 200 kinds of iris also in full bloom sported nearly every color imaginable. As we walked, waterways throughout the gardens brought cooling relief and soothing sounds to fortify us against the intense heat. In the Romantic Gardens, climbing roses and small cottage-style structures evoked a fairytale world while the Victorian Secret Garden took us back more than a century to the age of tropical plant collecting. We ate lunch at an outdoor table in an area shaded by trees and bordered by the Kitchen and Herb Gardens on one side and the Monet Gardens on the other. Afterward, we explored the rest of the plants, from the Rock Alpine Garden to the Western Panoramas to the Woodland Mosaic. My favorites included the Japanese Garden, with its koi pond and carefully pruned pines, and PlantAsia, whose serene walk featured a little wooden pavilion, a gentle stream, and inspiring quotes. At the end, we went to the top of Anna’s Overlook, an earth pyramid planted with ground cover and native grasses, to rest and survey the many kinds of gardens we had just experienced. 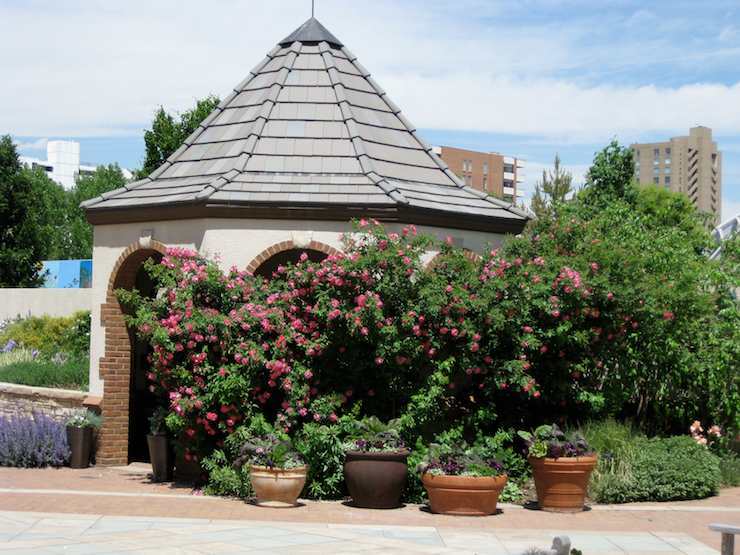 An insistent breeze cooled us as we marveled at the botanic gardens’ placement in the heart of Denver’s downtown amid highrises, low-rise apartment buildings, numerous churches, and an old neighborhood of single family houses. The next day took us to Boulder, where we walked tree-shaded Pearl Street, shopped, and enjoyed lunch at an outdoor café. Our first stop was Boulder Book Store, where my husband browsed books on politics and current events and where my intuition led me upstairs to the metaphysical section and a pass through the astrology books. At the end of the day, on our way to the car, we came across Lighthouse Bookstore, which specializes in all things mystical and metaphysical (or as my husband laughingly and lovingly calls it, “mumbo jumbo”). He set off to put more money in the parking meter and left me in the store to browse; about an hour later, while resting on a bench, he saw me emerge with a bag of books and other inspiring goodies along with tales of delightful conversation with the proprietor and his assistant about Chicago and its renowned hot dogs and pizza.